Overall a nice place and good location. The room was clean and fresh. I like the mini-kitchen and the bed was clean and comfortable. I did not like the shower or lack of daily cleaning service. The shower would not get hot. Overall an enjoyable stay. The distance from hotel to BTS and major shopping malls is quite a distance away, will be good if they can provide tuk tuk transport to and fro from BTS to hotel. We enjoyed our stay at Zensation. The family suite was clean & spacious with a kitchen and washing machine that came in very handy. The building is within a residential area, so plenty of cheap local food options to choose from. Security is excellent as there is always a guard at the front door. if you attending exhibition at BITEC, this is really the most convenient hotel to stay at. There are various free shutter to bring you to BITEC, even if you miss them, walking is only within 10min. Hotel is comfortable and clean. You'll find a lot of options for your stay in Bangkok with 2882 hotels and other lodging options to choose from, including 125 apartments. Make sure to enjoy the prominent temples and treasured shops in this culturally-rich area. Odeon Circle and Temple of the Emerald Buddha are popular places to discover. How do you know if an apartment is the best choice for your stay? Apartments are great for families looking for the conveniences of home, and also for solo travellers who want to stay in a quieter area. Though weather is just one consideration, it can have an impact on your travel plans, especially if you're planning for a longer stay. Since apartments often have stricter cancellation policies, it might be good to familiarise yourself with these weather averages before you book. 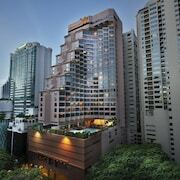 Visitors speak highly of Bangkok for its local art scene and temples. Cultural attractions include Jim Thompson House and Suan Pakkard Palace, whereas Lumpini Park and Santiphap Park are a couple of picturesque spots to enjoy the outdoors. You can also visit some other popular places in town including Odeon Circle and Temple of the Emerald Buddha. Nearby metro stations include Siam BTS Station, Rachathewi BTS Station and National Stadium BTS Station. If you'd like to explore more of the area, hop aboard a train from Bangkok Makkasan Station, Yommarat or Bangkok Hua Lamphong Station.